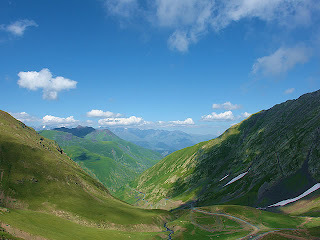 If you are thinking of travelling to Tusheti - this summer, perhaps - then I can recommend your employing "MN Georgien Travel". This company is run by Maia Veshaguridze, a "lamzur yeuH" ["pretty girl" in Bats] whom I met during my numerous stays in Zemo-Alvani. Without wanting to cast any doubt upon the professionalism and capability of the many other companies which offer tours to Tusheti, I feel sure that Maia - as a native Bats (i.e. Tush) - would be able to provide an additional "edge" to your stay in the region! Her company's best offer is a 10-day (walking, mostly) tour which would take you from Akhmeta in Kakheti up the Pankisi Gorge to Tbatana, over a c.3,000m pass to the source of the Alazani river, over another c.3,000m pass to Tsovata, from Tsovata along the Gometsari valley to Omalo, and then down from Tusheti over the Abanos pass (c.3,000m, again! ), back down to Kakheti... an exhausting but unforgettable and truly AMAZING trip! Besides speaking Georgian, Tush Georgian(! ), and a little Bats(!! ), Maia is also fluent in German (she studied History in Hannover, and has spent many years in Germany), and one of her colleagues in the company speaks very good English. Her company's website is here. (I have also added a link; top right corner of this blog.) And should you wish to contact her, you can do so at: --contact--at--mngeorgientravel--dot--ge. Should you have any more questions about travelling to Georgia and - more specifically - to Tusheti or to Tsovata in order to meet the Bats people, I would be delighted to help! For an account of an English family's trip through Tusheti on horseback in the summer of 2008 (just before the war between Russia/South Ossetia and Georgia broke out... not that the fighting even got remotely close to the beautiful mountain scenery of Tusheti! ), please go to this page, or go directly to their blog. 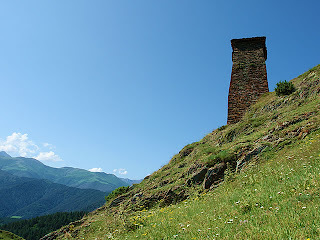 The best time of the year during which to go to Tusheti is - unsurprisingly - summer, but not for the usual reasons (i.e. warm weather and plenty of sunny photographs): The [truly amazing] road to Tusheti - which begins in Georgia's eastern province of Kakheti, a three-hour drive from the capital Tbilisi - crosses into Tusheti over the 3,000m-high Abanos Pass. The pass is only open to cars from early June to mid- or late september, and is only open to the rugged local shepherds from late April to mid-October... Good drivers can be found in the villages of Kvemo- and Zemo-Alvani in Kakheti; one should expect to pay around 120 Georgian Lari (roughly 80$) for a one-way trip in a Soviet or Japanese 4x4; the drive from Kakheti to Omalo takes around 7 hours (for a mere 80km - this should give you some idea of the road conditions! ).